If you are purchasing for a commercial business, go for the “.com” version. If your primary market is outside the United States, you may want the corresponding country code ending. For example, France is “.fr”, Germany is “.de”, Canada is “.ca”, etc. However, if you are a non-profit, opt for “.org”, which lends the organization an air of credibility. If you are part of a new educational venture, try for “.edu”. Once you decide on your domain name and business name, consider purchasing different extensions, and misspellings, and then having them redirect to your main site so that people in other countries can look for you. That way, if someone has a slight typo, they can still easily get to your website. An excellent way to choose a marketable name is to pick something that does not represent something specific. Think of “YouTube” or “Vimeo”: Easy to spell, but not reminiscent of anything. Finally, you want your business or organization to sound trustworthy and legitimate. Stay away from anything too cutesy or spam-like, so people are automatically confident in your brand. As a rule, keep your domain name short and straightforward over something clunky or long-winded. A shorter domain name will make it easier to remember, which automatically gives you an advantage. Another good thing to keep in mind is to be sure your domain is easy to pronounce. Try dictating it to someone over the phone to make sure it can be adequately understood. Just recall times that you weren’t sure how to spell something as you looked for it on the web. Did you have to type it into Google for it to pull up multiple possibilities? Did you perhaps give up on your search after a while? Think about the ease of user experience in your decision. 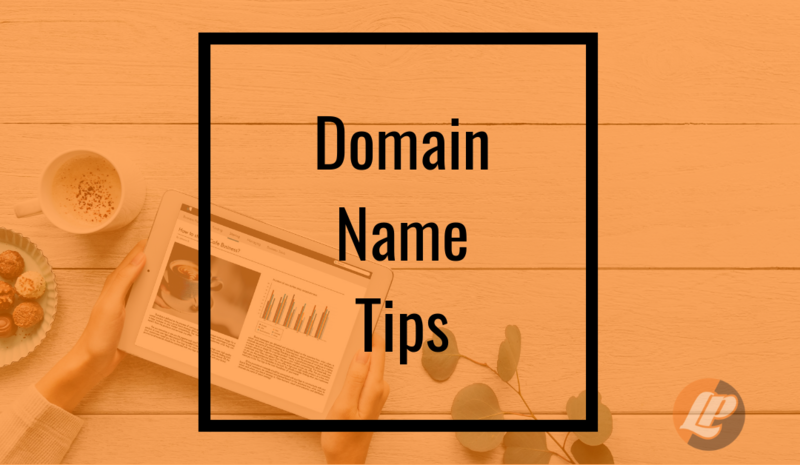 Before you even settle on a name for a company or organization, you should check that a corresponding domain name is a possibility. Cybersquatting, the act of buying domain names that use the names of current businesses to sell the names for a profit to those businesses, is, unfortunately, a real practice people take part in on the web. Purchasing the domain early on helps to avoid this while also giving you the benefit of having it for a more extended period, which may be helpful when it comes to your search engine optimization (SEO). After you finalize your domain name, be sure to sign-up for your corresponding social media handles as well. Facebook, Twitter, and Instagram are some of the most popular marketing tools out there today, so be sure you reserve those as soon as possible. If your domains taken on social media, don’t be afraid to get creative and add a prefix or suffix. Try to have all your social media using the same handles though for ease of use. It is always good to do a Google search to see what else is out there so that you do not accidentally choose something that is already trademarked. Also, be sure to do your homework and make sure your competitors don’t have a similar name already that could be confused for yours. If a domain that you want does happen to be taken already though, do not give up all hope. If the domain is not in use, there’s a good chance this is a case of cybersquatting. If this is true, the owner’s contact info will likely be parked on that website. If there is no contact info, use who.is to try to get the owner’s email and reach out to them. If there is a website on the domain, you can always try a last-ditch effort to contact the owner and see if they are willing to sell it off. If you do this, know the price you are willing to go up to beforehand and be prepared to negotiate. If the domain is empty, try looking through domain marketplaces such as Sedo, SnapNames, GoDaddy’s Domain Auction, or Flippa. If you’re purchasing an old domain, it may come with its own baggage. Looking into the history of your specific domain name to know what your new venture might be inadvertently associated with. Try using tools such as the WayBackMachine to get a look at the web content that used to live there. Be sure to check backlinks as well. Additional tools like who.is, bannedcheck.com and ismywebsitepenalized.com are also useful for understanding previous domain ownership. Learn more about buying a pre-owned domain by reading this great article from Search Engine Land.